One more on the passing of Jane Loeau, 1873. The Death of Jane Loeau. E waiho ia hoi ka hele a kipakuia—a. Ko Hawaii Ponoi, Buke I, Helu 8, Aoao 2. Augate 6, 1873. Short biography of Jane Loeau by her husband, S. L. Kaelemakule, 1873. A History of Jane Loeau. In the year 1847, Jane Loeau was boarding at the school of Mr. and Mrs. Cooke [Kuke], and she married John Robert Jasper [Keoki-pu], and he died. In the year 1855 perhaps, she married Marvin Seger [Sika] [? Martin Seger], and he died. In the year 1862, she married me. We were together for 10 years, 7 months, and 25 days in the covenant of marriage in peace and happiness. We did not leave one another, but it was the angel of heaven who has separated us, and I live with sadness and never-ending regret. [I am not sure if there is a continuation to this. Ko Hawaii Ponoi, Buke I, Helu 9, Aoao 4. Augate 13, 1873. More on Jane Loeau’s passing, 1873. Death of a Chiefess.—Jane Loeau, a descendant in the female line of the ancient chiefs of Kauai, and a reputed granddaughter of Kamehameha I., died suddenly in this city on Wednesday last. She was 45 years of age, and was in childhood an inmate of the Chief’s school under the charge of Mr. and Mrs. Cooke, at the same time with Kamehameha IVth and Vth and His present Majesty. The Pacific Commercial Advertiser, Volume XVIII, Number 5, Page 3. August 2, 1873. Ka Nonanona, Buke 1, Pepa 2, Aoao 5. Iulai 20, 1841. …windows; clear also are the rooms for the teachers and the students. There is an open space in the middle of the building; it is six feet wide and so too is the length; there is a water pump within it. Maniania [Manienie] grass grows there, so it is a nice place to play as well as to sit. There is a small lanai and a stone wall surrounding this wide area, which is a place to go when it is raining or when the sun is hot. The outside of the entire building is covered with mortar [poho]. Poho is not great; it will just fall off, and it soon loses its integrity. The inside of the building is covered with plaster [puna], and it is very good and sturdy; the children cannot make the plaster fall easily. The rooms are plastered all around and on top, and there is a fine floor below. The building is appropriate for what we are using it for. There are perhaps many who have heard of this schoolhouse but who have not seen it. 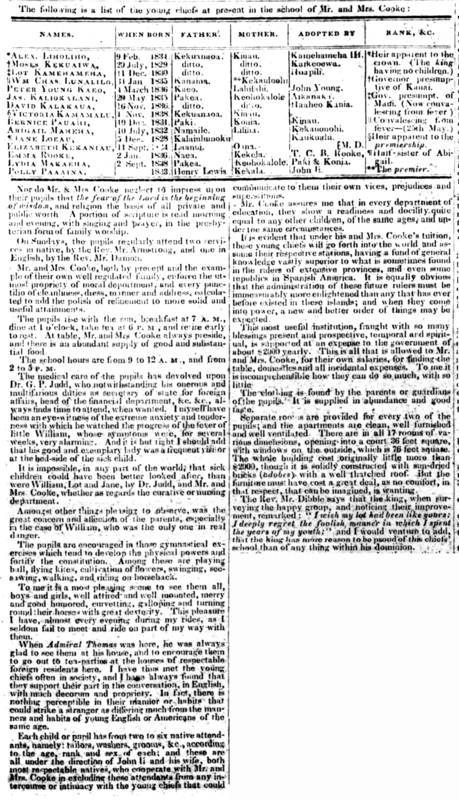 Therefore, the instructors thought to put a description in this paper, as well as what is being done in this schoolhouse in later issues of the newspaper. 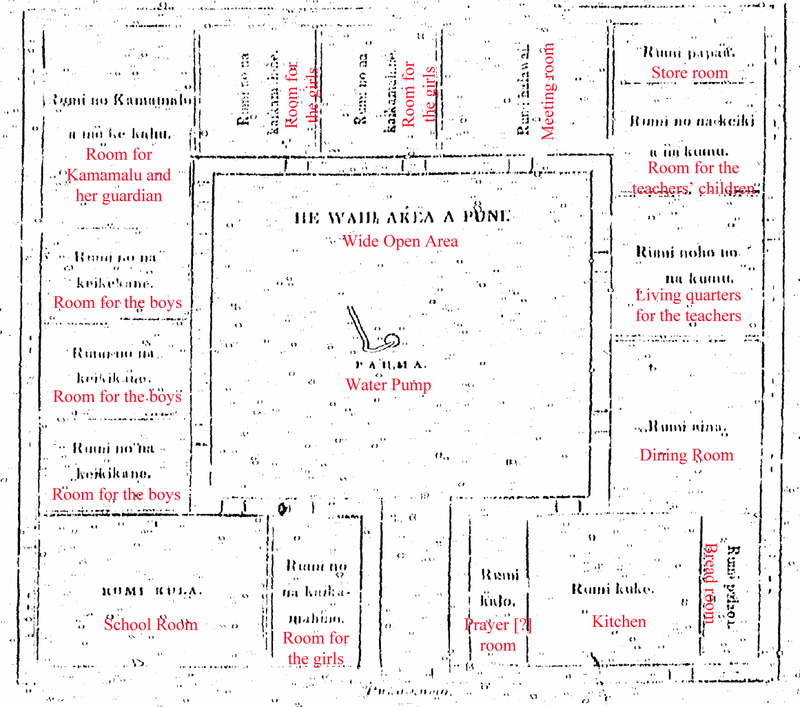 [Maybe if the Hawaiian-Language Newspapers like this one are rescanned clearly, the image of the schoolhouse would indeed be clear and we could see the doors, windows, and rooms. Ka Nonanona, Buke 1, Pepa 2, Aoao 6. Iulai 20, 1841. 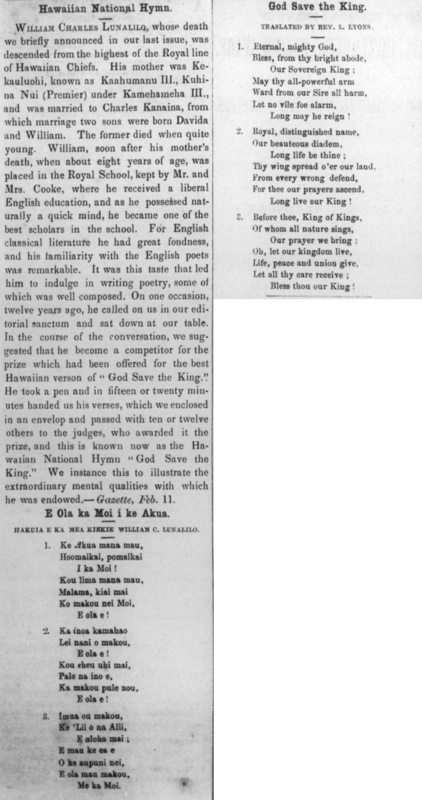 More on the Hawaiian National Hymn, 1874. William Charles Lunalilo, whose death we briefly announced in our last issue, was descended from the highest of the Royal line of Hawaiian Chiefs. His mother was Kekauluohi, known as Kaahumanu III., Kuhina Nui (Premier) under Kamehameha III., and was married to Charles Kanaina, from which marriage two sons were born Davida and William. The former died when quite young. William, soon after his mother’s death, when about eight years of age, was placed in the Royal School, kept by Mr. and Mrs. Cooke, where he received a liberal English education, and as he possessed naturally, a quick mind, he became one of the best scholars in the school. For English classical literature he had great fondness, and his familiarity with the English poets was remarkable. It was this taste that led him to indulge in writing poetry, some of which was well composed. On one occasion, twelve years ago, he called on us in our editorial sanctum and sat down at our table. In the course of the conversation, we suggested that he become a competitor for the best prize which had been offered for the best Hawaiian version of “God Save the King.” He took a pen and in fifteen or twenty minutes handed us his verses, which we enclosed in an envelope and passed with ten or twelve others to the judges, who awarded it the prize, and this is known now as the Hawaiian National Hymn “God Save the King.” We instance this to illustrate the extraordinary mental qualities with which he was endowed.—Gazette, Feb. 11. E Ola ka Moi i ke Akua. 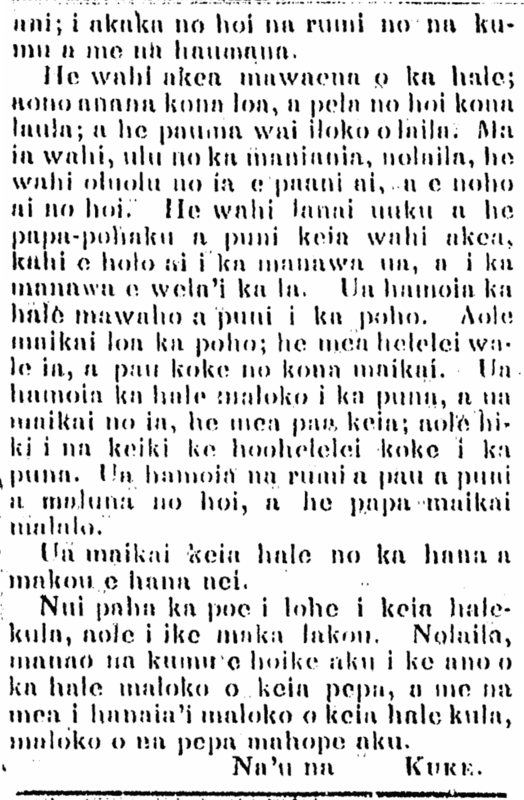 HAKUIA E KA MEA KIEKIE WILLIAM C. LUNALILO. TRANSLATED BY REV. L. LYONS. Thy wing spread o’er our land. The Friend, New Series, Volume 23, Number 3, Page 24. March 2, 1874.